radiation. 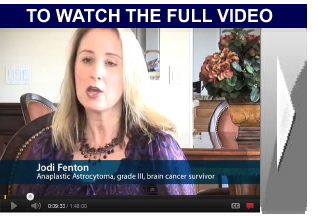 The autopsy showed she was completely cancer-free. Out of 52 reported cases of that disease, no one ever died cancer-free. looking out for the best interests of the people." Those who have crossed horns with the FDA over the years were quick to realize that particular federal agency serves as a corrupt enforcer of both Big Pharma and the American Medical Association. BothBig Pharma and the AMAuse campaign contributions to control politicians into writing regulations that favor the agenda of Big Pharma, and stifle medical doctor and medical research scientists who are too innovative to make sure their discoveries don't harm the practice of treating disease by eradicating the diseases from which the medical community earns its livelihood. The way Big Pharma and the AMA talk about cancer research you'd almost think they are serious about eradicating cancer. They are serious about finding new, more effective treatments for cancer, and for prolonging the life of cancer patients, but regardless of the medical rhetoric, finding a real cure for cancer is not on the Christmas wish of the AMA since treating cancer is big business. Curing cancerparticularly as quickly and effectively as Burzynski's cancer gene therapy doeswould drain a large chunk of the massive amount of revenue received by cancer treatment centers for chemotherapy and radiation treatment. Big Pharma, on the other hand, is working hard to find a pharmaceutical "cure" for cancer, and have several drugs now which are used to treat specific types of cancers. Today Big Pharma uses Zolinza (to treat T-cell lymphoma), Xeloda (to treat metastatic breast cancer and for colon cancer patients whose colon has already been removed), and Avastin (used to treat kidney cancer, brain cancer and lung cancerand metastatic colon cancer but only when used with intravenous chemotherapy). However, Dr. Stanislaw Burzynski, an internationally known cancer research physician was one of the early, and most successful, pioneers of cancer gene research. Burzynski is credited with the discovery of the molecular switch that allows him to turn off cancer cells without destroying normal cells. Unlike Big Pharma, however, Dr. Burzynski discovered that killing cancer is not a "one size fits all" treatment. For example, the cancer drugs noted above were created by Big Pharma to treat very specific types of cancer, suggesting the FDA believes that these drugs will not work on other types of cancer, so under FDA protocol, they are used only to treat the types of cancers for which the FDA has defined them to be prescribed. Dr. Julian Whitaker, MD, of the Whitaker Wellness Institute has examined Burzynski's case studies and the findings of the National Cancer institute with respect to those case histories. He is on the record as saying: "It was obvious to me that Dr. Burzynski had made the most important discovery in cancer treatmentever! It's what we have been looking for." Burzynski is a native of Poland. He attended Lublin Medical University where he graduated first in his class on Feb. 18, 1967at 24 years of age. He received his Ph.D in biochemistry the following year. While working towards his biochemistry Ph.D, Burzynski made a profound discoverya string of peptides in human blood and urine that had never been discovered in biomedical research. As he continued his research, Dr. Burzynski also discovered that people with cancer lacked these peptides in both their blood and urine, while those who are cancer-free have an abundance of them. Whitaker viewed that discovery as being similar to waking up one morning and discovering a whole bunch of islands just off the coast of Miami, Florida. His discovery has led to a branch of medicine in what is now known as personalized cancer gene therapy. Under the Burzynski protocol, the approved gene therapy drugs are customized based on the molecular characteristic of that patient's genes and the cancer itself. While the medical community today is just beginning to explore this technology, Dr. Burzynski has been practicing it for almost two decadesone of them in court fighting the FDA and the Texas Medical Board. The Texas Medical Board has been trying since 1986 to revoke Burzynski's medical license for, I guess, curing cancer instead of just treating it like the rest of the medical community. His clinic performs a molecular cancer genome on the patient. From the results, they create a molecular profile to identify which genes are allowing cancer to grow in the patient's body. Based on the data received, Burzynski prescribes the best personalized combination of drugs from a wide array of FDA approved gene-targeted medications providing his patient with a uniquely-individualized treatment. The patient in the primary video (above), Chris Onuekwuski, a geo-tech engineer who lives in Austin, TX. He had colon cancer. Based on the type of cancer he had, and the fact that he refused to have surgery or chemotherapy, none of these drugs were FDA-approved to treat his cancer. But, based on Onuekwuski's genetic markers, the computer model picked those drugs to kill his cancer in 2007. In less than three months after he began personalized gene-targeted cancer therapy, Chris Onuekwuski was cancer-free. The MD Anderson Cancer Center told him that without colon surgery, he was going to die. The Texas Medical Board has scheduled a new hearing to revoke Burzynski's medical license. If it succeeds it will, very likely, result in Antineoplaston not gaining FDA approval. This, of course, will set personalized gene therapy back another decade. If it's not approved, you can bet that once Burzynski's patent-rights to Antineoplaston expire, Big Pharma will grab the patent rights and claim they have discovered a universal cancer curethat only the elite and the favored can afford. The FDA fought to destroy the herbal cancer cure "discovered" by a horse on John Hoxsey's farm in Illinois around 1890, managing to outlaw the Hoxsey cancer cure in the United States in 1968. They are now knee deep in their second battle to revoke Dr. Burzynski's medical license for no other reason than his success in curing cancer using personalized gene therapy. The FDA insists it's because he is using non-FDA approved gene therapy drugs. What they mean is that he is not using them to target the types of cancer they approved the drug for. He is using them, very successfully, to kill the cancers killing his patients through personalized cancer gene therapy that matches specific drugs with the genetic makeup of the specific cancer cells attacking a specific patient. Burzynski knows its because one of his patients, Chris Onuekwuski, declined the colon surgery recommended by the University of Texas MD Anderson Cancer Center. He was told the surgery was the only thing that would prolong his life. Onuekwuski told a physician's assistant from the MD Anderson Center that the Burzynski Clinic would use gene therapy to treat his cancer. Onuekwuski said that when he told the PA that "...everything went quiet. You could hear a pin drop. And that was it. So, I said, forget MD Anderson." Burzynski won his original ten year fight against the Texas Medical Board, being found not guilty by the Texas Supreme Court. Next April the Medical Board will try again to pull his medical license for using a host of gene therapy drugs in ways not approved by the FDAin particular, the use of non-approved druga substitute for his non-FDA approved Antineoplastonby using the FDA-approved drug, Pheylbutyraten (also known as PB), for it. Pheylbutyraten is FDA-approved for a specific type of leukemia, but it's not FDA-approved for colon cancer. Nor were any of the other gene therapy drugs Burzynski used to cure Oruekwuski's colon cancer. They were prescribed based entirely on Oruekwuski's genetic markers. 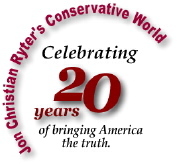 Richard Jaffe, the defense lawyer for the Burzynski Clinic, said that cancer establishment's idea is that "...once we tell you that you are going to die, you have to die. You can't do anything else. When you have 550 thousand people who are dying of a disease every year, why should the cancer-chemotherapist tell you there's nothing more you can do? Why shouldn't that be your choice rather than the cancer establishment? And that's really what's involved in this case." In July, 2006 Bettye White, who had previously been diagnosed with Merkle cell cancer at the University of Tennessee Medical Center, and who had received chemotherapy without lasting results, was told by Dr. Eric Carlson, MD, the head of Oncology at the Medical Center she needed another chemotherapeutic treatment for her recurring Merkle cell cancer. At that time, she and her husband did some research on the Internet and found Dr. Burzynski's clinic in Houston. After building a a molecular cancer genome on Mrs. Wright, Burzynski prescribed Sutent, a gene-targeted cancer medicine that is FDA approved for kidney cancer, stomach cancer and some forms of pancreatic cancer. But not Merkle cell throat cancer. Along with Sutent, the protocol also added PB. When the Wright's returned to Dr. Carlson's office for their post-treatment follow-up visit, all of the tumors under Bettye Wright's chin and in her throat were gone. 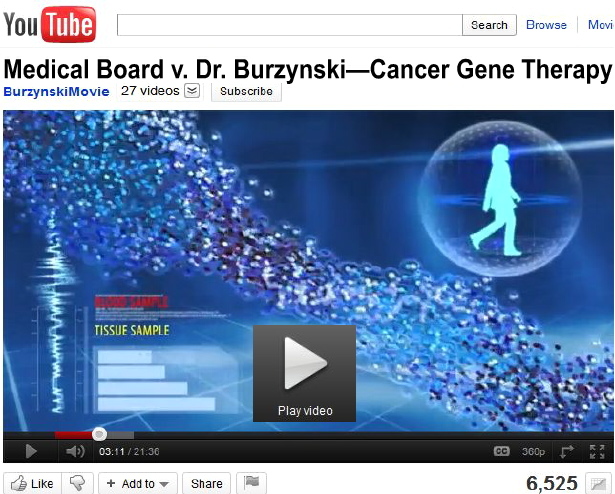 Carlson's view of Dr. Burzynski? "I think he's out of the box, and that's what Mrs. Wright needed. She needed some fresh ideas, and that's what has resulted in her success. Someone took a chance and applied an off-label use to a medication that is used everyday in our cancer center, but not in this application and it has shown some lasting benefits." Someone "took a chance?" Meaning, even though the computer molecular cancer genome indicated the best chance to save the lives, and cure the cancers that were killing people like Bettye White and Chris Onuekwuski and scores of other gene therapy patients who found the Burzynski Clinic, was the off-label use of FDA-approved cancer therapy drugssimply because the FDA did not prescribe them for the types of cancer they were used to cure, it became an offense justifying the revocation of a trained physician's medical licensefor saving lives? If that's the case, it is time to get rid of the FDA. Now. That needs to be a pledge made by each and every GOP candidate for President. And, Congress needs to make the same pledgeand carry through on it. Has science in the United States returned to the days of Copernicus and Christopher Columbus where innovationscientifically-correct innovationis punished and mediocrity is both protected and rewarded? When the medical bureaucracy becomes more powerful than the people it's time for the people, using whatever legal, constitutional forced is necessary, to rid themselves of the bureaucracy. "This stuff," Dr. Carlson said, "is not taught to you in medical school. The medical curriculum we all go through is traditional and very vanilla. And they don't teach you this level of thinking. It goes one step beyond." Burzynski's lawyer, Richard Jaffe said, "What we know is that ten years from now there will be...multi-agent gene-targeted therapy. There's going to be that. Everyone's going to get genetic testing, but that's ten years down the road." Ten years too late for hundreds of thousands of people who will needlessly die from cancers that can easily be cured today but for an archaic medical monitoring system that is so full of itself because it possesses the self-empowered authority to deny lifesaving medical care because the princes of the medical care industry are content with an outdated status quo that allows them to play God. On Nov. 3, 2001, John Gever, Senior Editor of MedPage Today reported that the American Society of Clinical Oncology released a blueprint for cancer research that calls for major changes in drug development and clinical trial design, with a greater reliance on information technologyprecisely the type of technology utilized by the Burzynski Clinic today. There's no reason in this age for anyone to die of cancer. They are dying not because of there's no cure. They are dying because, today, one man controls the key that opens the door to that technology. The princes of industry and the barons of the medical industry would rather keep the door locked until they find a key of their own. When the oncologists who designed the personalized cancer cell gene therapy datasystems, and who actually treat cancer victims with those state-of-the-art space age computer technology programs that match the cancer therapy drugs with the genome of the patient, are overruled by political bureaucrats who are owned by Big Pharma, its time to get rid of the bureaucrats. The cancer cure exists. Whether or not it will still be available when you need itor I need itor my family, or your family, needs it, depends on what you do when you finish reading this, and watch the attached videos.